In the dangal of UP politics, much as Muzaffarnagar wants to leave its past, the shadows are never far behind. Rediff.com's Archana Masih visits the offices of political parties, shops and people's homes in Muzaffarnagar and Kawal to discover that even if the political parties don't want to, its people want to drop the suffix 'riots' from Muzaffarnagar. IMAGE: Bharatiya Janata Party workers in the BJP's poll office in Muzaffarnagar. "Kawal ke babaal ne Modi ka future hi badal diya (the fracas in Kawal changed Modi's future)," says Mira Singh, bending over the railing of her house, overlooking the courtyard where two Jersey cows rest quietly. "Kawal case, didi, famous hai -- Modi PM toh ban sakte the, par itne vote se nahi jeette agar yeh kaand nahi hota (The Kawal case is famous. Modi would certainly have become PM but wouldn't have won with such a majority had it not been for the Kawal case)." Mira sits down with her mother on a charpoy beside the cows and rattles off the margins of victories of BJP candidates in UP who won with over 4 lakh votes in the Lok Sabha elections of 2014. Her sharp political insights -- the details of the candidates in the fray, the voting pattern of the district, the trends of this election, the en masse voting by Hindus for the BJP after the Muzaffarnagar riots etc -- would put the best political pundits to shame. In her jat-accented Hindi, she holds forth with a confident ease. Listening to her punditry is a treat. More so, because she comes from a deeply conservative home and requests that no "pic" of her should be published in this article. "I wouldn't even have come down if my father was home," she says. Mira had finished her graduation in 2013 when an eve-teasing incident in her village of Kawal resulted in three killings that erupted in the Muzaffarnagar riots. Sixty people died in the riots, thousands were displaced. The direct fallout on Mira, which shows how such incidents alter lives beyond what we hear or read in the newspapers, was that her father denied her permission to enrol in a B Ed course in Muzaffarnagar or Meerapur, where the closest colleges are. It was no longer safe for her to take the one hour ride on local buses anymore. "For one year, there was dehshat (fear). Almost all the Muslims left the village, some Hindus too. But we did not leave our home. This gate remained open like it is now," says her mother Maheshi, who is called 'Bhabhiji' by the Muslim families in the village where the Hindu and Muslim vote is numerically almost the same. Hindus and Muslims stopped speaking to each other, attending each other's weddings in the first year after the riots. Then slowly, those who had left, returned. Now things are as they were before. "Hindu-Muslim mein ab pehle jaisa uthna baithna hai (We go to each other's homes and mingle like we did in the past)." Mira did not enrol for B Ed that year or in subsequent years. If there was a B Ed college in Jansath it would have been ideal, going further, is still considered unsafe. Once four boys had teased her. "Sabe badi izzat hove hai (self respect is most important)," says her mother. In that large courtyard, with fields stretching behind, the mother-daughter share their thoughts as the call of the azaan rises from the mosque. The temple is down the road. Worried about her daughter's marriage, the family has approached prospective grooms and asked them if they would allow her to pursue a B Ed after marriage. We would pay, they told them, but prospective matches have not agreed. As Mira offers us a cup of tea that she has quickly made, I ask how she spends her day. "Just think I am a housewife, without being one," she laughs. IMAGE: The temple in Kawal. 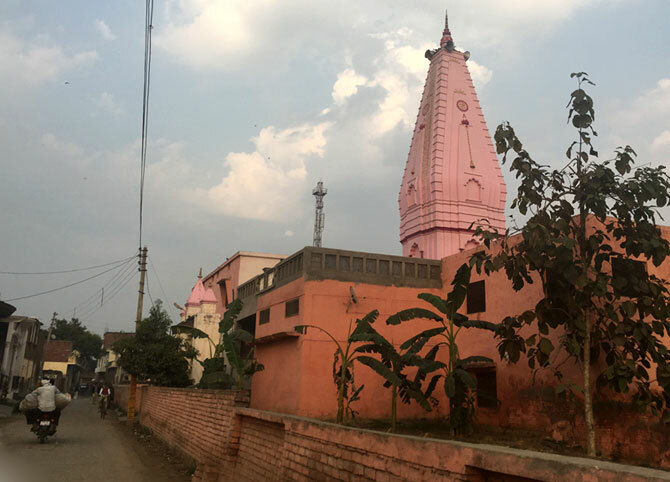 The population is almost evenly divided between Hindus and Muslims in the village. On the single road that runs through the village, where the Muslims reside around the masjid and the Hindus on the other end, we had walked into the house with the open gate and started chatting with Maheshi as she came to fetch water from the hand pump. Guarded at first, she took us in and we ended up talking for an hour about Modi, the UP election and life itself. Covering the election in Western UP, it is heartening how people open their homes or talk across a shop counter or by the wayside, over a cup of tea -- the ultimate Indian unifier. The family has voted for the BJP since the Ram temple movement in the early 1990s and say that the shadow of the riots still looms large on the political equation even if it doesn't on people-to-people relations. "Never before has any candidate from Kawal been given an MLA ticket. This time many diggaj MLAs did not get a ticket, but Vikram Singh Saini from Kawal got it -- why, just because of the Kawal kand (incident)," says Mira, pointing out how the BJP is once again attempting to consolidate the Hindu vote in Western UP. IMAGE: Gopal Singh at his friend's shop in Muzaffarnagar. "Modi is the only leader in the BJP," he says. 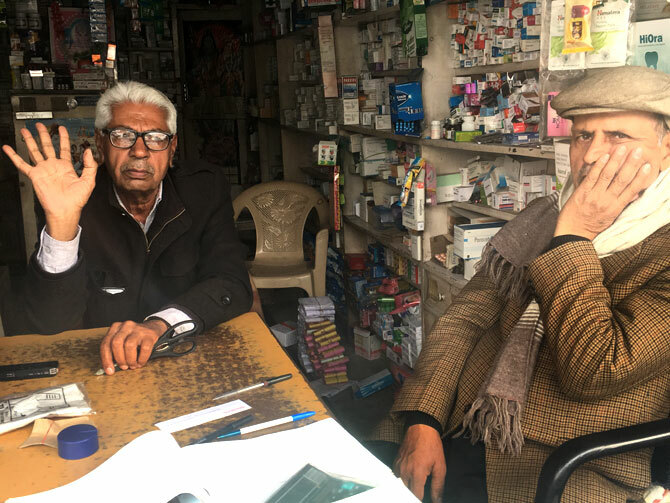 Sitting in a friend's medicine shop in main Muzaffarnagar, not far from the BJP office, Gopal Singh, a jat, who will vote for the BJP in spite of Ajit Singh's jat-centric Rashtriya Lok Dal being in the fray, is unsure of the BJP's victory. "This time the Hindu vote is divided. Aur notebandi se baniya log khush nahi hai. Par main toh Modi ko doonga. Bas Modi hi hai BJP mein, aur khuch nahi hai (Traders are unhappy about demonestisation, but I will vote for Modi. The BJP is nothing without Modi)," he says, as customers who come to buy medicines linger to listen to him. "Yeh mat sochna ki BJP se 73 candidate jeete hai UP mein, sirf Modi jeeta hai (Don't think 73 BJP candidates won in the Lok Sabha from UP, there was only one victor -- Modi)," says Singh in a booming voice adding that the one change that has happened in the Samajwadi Party government's tenure is that all housing colonies in Muzaffarnagar city have become gated enclaves. 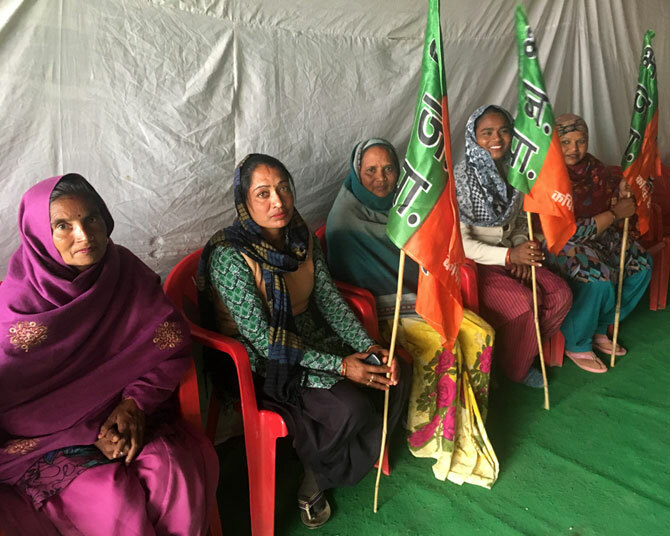 Down the road, in the banner-flag festooned BJP office, where tea and snacks are being served to party enthusiasts, Babita Gupta and Basheshwar Dayal, two district office bearers, say the contest this time is between the BJP and SP. The Bahujan Samaj Party and RLD (which was wiped out in the 2014 Lok Sabha election) are fighting a tough battle in Muzzaffarnagar. "When Chaudhary Charan Singh (the former prime minister and Ajit Singh's father) was alive, the entire jat vote used to go to him. Even the wives of jat Congress netas would vote for his party, but the BJP has taken a big share of their vote," adds Gopal Singh. 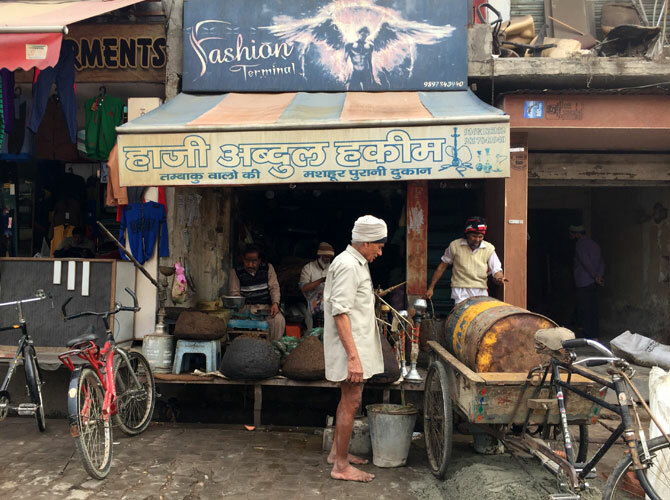 "Mayawati Behenji ka vote toh koi tod hi nahi sakta, par vyapari unko pasand nahi karte hai, na woh vyaparion ko ticket deti hai (nobody can shatter Mayawati's core vote, but traders do not like her, neither does she give them tickets)," says the shop owner sitting beside him. IMAGE: A tobacco shop in Muzaffarnagar. All shops were open on a Sunday. Round the corner on a busy Sunday -- where most shops were open -- the BSP office is calm. The three men sitting in the sun are soon joined by a small group that emphasised that UP's voters wanted a return to the rule of law that existed when Mayawati was chief minister. "Muzaffarnagar has had no history of riots like neighbouring Meerut, which is a communal tinderbox," says a BSP worker in the group. "The riots were caused by the SP and BJP. The Hindu-Muslim tension exists only at a political Hindu-Muslim level. On a day-to-day basis there is no problem." The BSP and SP offices in Muzaffarnagar occupy two parts of the same building. Part of its ground had been used for a celebration the previous night and workers were wrapping up the tents and piling up the chairs. At the SP office, people say it was all a BJP sajish (conspiracy) to defame the SP. BJP office bearers say the SP pressurised the district and state administration to favour the Muslims. is there any lingering effect of the riots between the two communities in the city, I ask. "Yaha Hindu na Musalman, yaha insaan basta hai (Neither Hindus or Muslims, only human beings live here)," quips an an SP worker. IMAGE: People outside a mosque in Kawal. Almost all the Muslims had left Kawal after the riots, but returned later. All is peaceful now, they say. 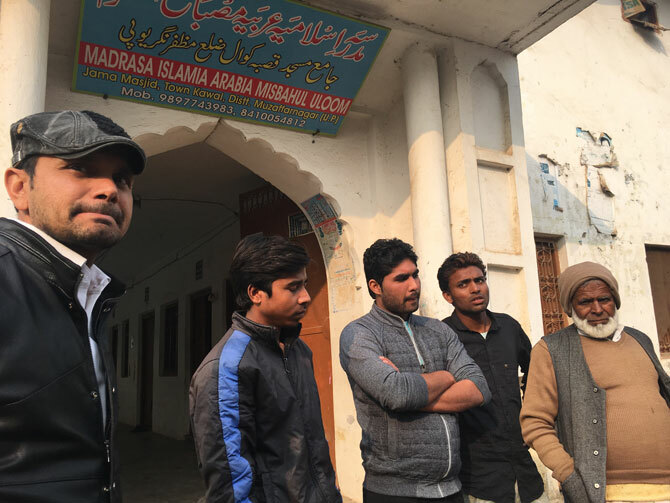 In Kawal, the epi-centre of the riots, which is located an hour away from Muzaffarnagar, men outside the local mosque say that relations are normal now -- historically, they add, there has never been tension between the two communities. Standing among them is Raja Abdullah. Five of his relatives are in prison for the killing of two jat boys after an the eve-teasing of a Hindu girl by Muslim youth. After the eve-teasing incident, Shahnawaz, a young man, was killed, allegedly by eight men. He was Raja's cousin. In retaliation, two jat boys were lynched by a Muslim mob in Kawal, which triggered the riots in Muzaffarnagar district and the neighbouring district of Shamli. His relatives, Raja says, are innocent and those who killed the jat boys had come from outside Kawal. "No one seems to hear us," says Raja, a door-to-door cloth salesman, who says the family's earnings have suffered after the riots. Two other friends sit beside him, one of them, Avesh Ashraf, says incidents of murder are nothing new in the district. "Lekin usko hamare UP mein itna chamka diya tha ki usme Hindu Muslim toh honi thi. Bas hamara gaon badnaam hona tha aur kuch nahin (They highlighted this so much that Hindu-Muslim tension were bound to escalate. It was all to give our village a bad name)," Avesh says. The boys blame the BJP candidate standing for election for escalating the tension, but say that the relations between the two communities are normal now. "This issue is not being fanned in this election like it was in 2014," adds Avesh. In the sparse room, the three Muslims boys say they will vote for Akhilesh Yadav and his Samajwadi Party because he has improved electricity supply and provided a good ambulance service. "Mohammedan ki apni koi party bhi toh nahin hai. Mayawatiji ka koi bharosa nahin hai. Akhileshji ne hi kaam kiya hai, woh sabne dekha hai (Muslims don't have a party of their own. Mayawati can't be trusted. Only Akhilesh has worked and we have seen it)," says Avesh. In this dangal of UP politics, much as Muzaffarnagar wants to leave its past behind, the shadows are never far behind.